Question 1: What is GST? Question 2: On what supply is GST levied? Question 3: Will GST be levied on all goods or services or both? Question 4: How many types of GST will be levied on different kinds of supply of goods or services? Question 5: Whether a registered person will have to approach two authorities – Centre as well as State for various permissions, audit etc. under the Act? Question 6: What is destination based consumption tax? Question 7: Who will pay GST? Question 8: What is Input Tax Credit? Question 9: Is GST going to increase compliance burden on the trade? Question 10: What is the threshold for registration in GST? Question 11: Is an agriculturist liable to registration? Question 12: What is the most important precaution to be taken to avail the facility of threshold exemption? Question 13: I am engaged exclusively in the business of supplying goods or services which are exempt from GST. Am I liable for registration? Question 14: How do I make supply, if I have not applied for registration? Question 15: How can an application for fresh registration be made under GST? Within what time will registration be granted? Question 16: I was registered under VAT but not under Central Excise. Do I need to apply for new registration? Question 17: If I have obtained provisional GSTIN (PI D), can I use the same on the invoice to make supply without waiting for final GSTIN? Question 18: I am a SME selling printed books after printing and have a turnover of twenty-five lakhs rupees per annum. I print only Children’s picture, drawing or colouring books which are exempt from GST. Do I need to register? Question 19: If I register voluntarily though my turnover is less than Rs. 20 lakhs, am I required to pay tax on supplies made post registration? Question 20: How will taxpayer get the certificate of registration? Question 21: Can registration particulars once furnished be amended? Question 22: In which State will a person be registered? Question 23: Are all manufacturers necessarily required to be registered under GST? Question 24: Who is liable to issue a ‘tax invoice’ and how many copies are required to be issued? Question 25: What details are to be contained in a ‘tax invoice’? Question 26: Is it necessary to issue invoices even if the value of transaction is very low? Question 27: When should a tax invoice be issued for goods? Question 28: In case of supply of exempt goods or when tax is paid under Composition Scheme, is the registered person required to issue a tax invoice? How a bill of supply is different from a tax invoice? Question 29: If goods are transported in semi-knocked down condition, when shall the complete invoice be issued? Question 30: Is there any scheme for payment of taxes under GST for small traders and manufacturers? Question 31: What is the eligibility criteria for opting for composition levy? Which are the Special Category States in which the turnover limit for Composition Levy for CGST and SGST purpose shall be Rs. 50 lakhs? Question 32: What is the form in which an intimation to pay tax under the composition scheme needs to be made by the taxable person? Question 33: What is the rate of tax under Composition levy for a manufacturer? Question 34: Are all manufacturers eligible for composition scheme? Question 35: When will a registered person have to pay tax? Question 36: A person availing composition scheme during a financial year crosses the turnover of Rs. 75 Lakhs I Rs. 50 Lakhs during the course of the year i.e. say, he crosses the turnover of Rs. 75 Lakhs/Rs. 50 Lakhs in December? Will he be allowed to pay tax under composition scheme for the remainder of the year i.e. till 31st March? Question 37: For the purpose of availing composition how will aggregate turnover be computed for the purpose of composition? Question 38: Can a person who has opted to pay tax under the composition scheme avail Input Tax Credit on his inward supplies? Question 39: How is a manufacturer under the composition scheme required to bill his supply? Can a registered person, who purchases goods from a composition manufacturer take input tax credit? Question 40: How would a manufacturer under the composition scheme who receives inputs or input services from an unregistered person pay GST? What will be the tax rate if the purchase is from a person availing composition? Question 41: In case a person has registration in multiple States, can he opt for payment of tax under composition levy only in one State and not in other States? Question 42: What is the effective date of composition levy? Question 43: What is the validity of composition levy? Question 44: What are the other compliances which a provisionally registered person opting to pay tax under the composition levy need to make? Question 45: Can a person paying tax under composition levy, withdraw voluntarily from the scheme? Question 46: Will withdrawal intimation in any one place be applicable to all places of business? Question 47: Can a person paying tax under composition scheme make exports or supply goods to SEZ? Question 48: Can a manufacturer under composition scheme do job-work for other manufacturers? Question 49: How can tax payments be made by a registered person under the composition scheme? Question 50: Does a registered person under the composition scheme pay his taxes every month? Question 51: What are the accounts a manufacturer under the composition scheme needs to maintain? Question 52: Does a manufacturer under the composition scheme need to maintain details of accounts of every supply received and made? Question 53: Does a manufacturer under the composition scheme needs to maintain account of inputs tax credit? Question 54: Can a manufacturer under the composition scheme maintain his accounts manually? And can he issue his bill of supply manually? Question 55: Whether a registered person under the composition scheme needs to learn HSN code of any input purchases and output supplies? Question 56:. What return a registered person under the composition scheme needs to file and at what frequency? Question 57: What details are required to be furnished in the return to be filed by the registered person under the composition scheme? Question 58: What is frequency of furnishing details of outward supplies in GSTR-1 for small taxpayers who are not under composition scheme? Answer: GST stands for Goods and Services Tax, which is levied on supply of goods or services. “Supply” is a legal term which has very broad sweep and various types of economic activities are covered by it. For example, sale of goods is a type of supply. Answer: GST is levied on all types of supplies which are — (i) made for a consideration and (ii) are in the course or furtherance of business. There are some exceptions when these conditions are not met, yet supply is considered to have been made, for example, interstate stock transfer of goods even without consideration or importation of services even if not in the furtherance of business. Answer: No, GST will not be levied on alcohol for human consumption. GST on Crude, Motor Spirit (Petrol), High Speed Diesel, Aviation Turbine Fuel and Natural Gas will be levied with effect from a date to be decided by the GST Council. Electricity and sale of land and building are exempted from levy of GST. Securities are neither goods nor services for the purposes of the Act and therefore supply of securities is not taxable. Answer: GST is a dual levy to be simultaneously levied by both Centre and State. On every supply within a State (intra-State supply), GST levied will have two components – Central Tax and State Tax popularly called CGST and SGST/UTGST. On every supply across States (inter-State), Integrated Tax popularly called IGST will be levied. The rate of CGST and SGST/UTGST would be equal. IGST would be levied at a rate equal to the sum of CGST and SGST/UTGST. Answer: No, a registered person will have to approach only one tax authority for all practical purposes. Each registered-person would have one tax administration office, either of the Centre or of the State. Legal provisions (called cross-empowerment) have been made to ensure that one officer can discharge all functions under CGST, SGST and IGST Act. The registered person would be informed of the tax administration concerned with him. A common registration is granted for the purposes of CGST, SGST/UTGST and IGST. Answer: When a supply originates in one State and is consumed in another State, tax can accrue to either of the two States. In a destination based consumption tax, taxes accrue to the State where the supply is consumed. In origin based tax, the tax accrues to the State where the supply originates. GST is basically a destination based consumption tax. For example, if a car is manufactured in Chennai but is purchased eventually by a consumer in Mumbai, SGST (or the State-component in IGST) would accrue to Maharashtra and not to Tamil Nadu. Answer: GST is generally paid by the supplier, i.e. the one who makes the supply after collecting it from the recipient. The supplier collects GST from the recipient of the supply as part of the consideration. However, in a few exceptional cases, the recipient, would be liable to pay GST to the Government on reverse charge basis. Answer: A person doing business will be purchasing goods/availing services for making further supplies in the course or furtherance of business. When such purchases are made by him, tax would have been charged by his supplier and collected from him. Since tax is collected from him, he can avail credit of the tax paid by him to his supplier (that is to say, he can use this amount for making payment of tax due from him on further supply made by him). This is known as input tax credit for the recipient. Answer: No. On the contrary GST will result in streamlining of processes and reduction of compliance burden. GST is a simple tax which uniformly applies across the country. GST has been designed to have minimal human interface and would be implemented through strong IT platform run by GSTN. Also, in the earlier regime there were multiple compliances required for taxes such as Central Excise, Service tax, VAT etc. with Centre and State. GST makes it single and uniform compliance for indirect taxes across the country. Under GST, there is just one interface with no face-to-face meeting between taxpayers and tax authorities and practically every activity will be done online. Answer: A person having business which has aggregate turnover of more than Rs. 20 lakhs calculated for a given PAN across the country would need to register under GST. There are some exceptions to this rule as mentioned in section 24 of the GST Act. Aggregate turnover is defined in section 2(6) of the said Act. For example, assume that a taxable person’s business is in many States on same PAN. All supplies are below Rs. 10 lakhs but collectively they are above Rs.20 lakhs. He would be required to register under GST. Answer: No. An agriculturist, to the extent of supply of produce out of cultivation of land is not liable to registration. 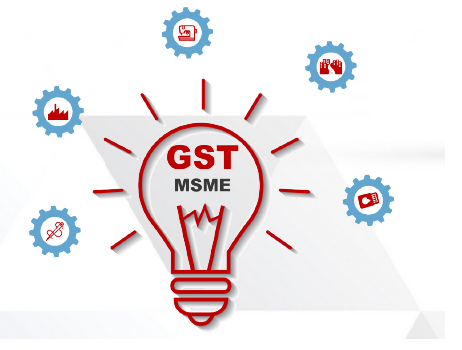 Answer: An MSME availing threshold exemption should not make any inter-State supply of goods whatsoever, though the MSME may receive supply from other States.They may, however, make inter-State supply of services. Answer: You should apply for registration at the earliest on the GST common portal and obtain application reference number (ARN). You need not disrupt your business and may continue to make supplies on invoices without GSTIN. The application for registration must be made within 30 days of the turnover crossing Rs. 20 lakhs or attracting any of the conditions mentioned in section 24. After registration, you can issue revised in-voices as permitted under section 31(3)(a) of the GST Act. These supplies should be shown in the return and taxes paid on them. Answer: Application for fresh registration is to be made electronically on the GST common portal (www.gst.gov.in) in FORM GST REG-oi. If the details and documents are in order, registration will be granted within 3 working days, except in cases where an objection has been raised within this period in which case registration will be granted within a maximum period of 17 days. Answer: No. Existing registrants of VAT having valid PAN have been issued Provisional I D and password. If you have not received provisional ID, please contact your tax administration to obtain the same. This Provisional Identity Number (PI D) would eventually be your GSTIN, when the migration process is completed. Answer: Provisional GSTIN (PI D) would eventually be your final GSTIN. The number would remain the same. Yes, you can use this PI D on invoice for making supply without waiting for final GSTIN. Answer: No. A person dealing with only exempted supplies is not liable to registration irrespective of his turnover. Section 23(1)(a) of the GST Act refers. Answer: Yes. If you obtain voluntary registration despite the turnover being below Rs. 20 lakhs, you would be treated as a normal taxable person and would need to pay tax on supplies even if they are below the threshold for registration. You will also be entitled to take input tax credit. Answer: The taxpayer can himself download the certificate of registration online from the GST common portal (www.gst.gov.in). Answer: Yes, request for amendment has to be made online. All amendments in registration particulars, except some core fields, can be amended in the system without the intervention of any official by merely filing the details of the amendment. Also for amendments of core fields, approval may be needed. Examples of fields which require approval are- legal name of business, address of the place of business and addition, deletion or retirement of partners or directors etc. responsible for day to day affairs of the business. Examples of fields which can be amended without any approval are- change of telephone number, email ID, bank account etc. Answer: A person liable to be registered has to apply for registration in each State from where he makes or intends to make outward supplies under GST. Within each State, generally only one registration is required to be obtained. Answer: No, there is no provision requiring that a manufacturer irrespective of threshold or nature of supply register himself under GST. For example, a manufacturer dealing only in exempted goods or where his turnover is only intra-State and below Rs.20 lakhs, is not required to be registered. Answer: Every registered person (other than a registered person availing the benefit of composition or a registered person supplying exempted goods or services) supplying goods or services or both is required to issue ‘tax invoice’. Invoice should be issued in triplicate. The original copy is meant for buyer, duplicate for transporter and triplicate copy for record of the seller. A registered person under composition scheme or supplying exempted goods or services shall issue a bill of supply instead of a tax invoice. Answer: The tax invoice shall contain details as specified in the rule in this regard. The key details specified in the rules are – name, address and GSTIN of the supplier and the recipient(if registered), a unique number of the invoice and the date of issue, description of goods, value of goods, rate of tax, amount of tax and signature. Answer: A registered person may not issue a tax invoice if the value of the goods/services supplied is less than RS.200, subject to the condition that the recipient is not a registered person and the recipient does not ask for such invoice (if the recipient asks for the invoice then the same must be issued, irrespective of the value). In such cases, the registered person shall issue a consolidated invoice at the end of the day in respect of all such supplies. Answer: Tax invoice for goods shall be issued on or before the time of removal/delivery of goods. In case of continuous supply of goods, it shall be issued on or before the time of issue of statement of accounts /receipt of payment. Answer: No. In such cases, the registered person shall issue a Bill of Supply and not a tax invoice. The bill of supply is different from a tax invoice both in name and details contained. While most of the details to be provided in a bill of supply are similar to tax invoice, the bill of supply does not contain the rate of tax and the amount of tax charged as the same cannot be collected. Answer: When goods are transported in semi-knocked down condition, the complete invoice shall be issued before dispatch of the first consignment. Delivery challan shall be issued for subsequent consignments. Original copy of invoice shall be sent along with the last consignment. Answer: Yes. Composition levy is an alternative method of levy of tax designed for small taxpayers whose turnover is up to Rs. I crore (Rs.75 lakhs for special category States, excluding J&K and Uttarakhand). It is a kind of turnover tax. The objective of the scheme is to provide a simplified tax payment regime for the small tax payers. The scheme is optional and is mainly for small traders, manufacturers and restaurants. Answer: Composition scheme is a scheme for payment of GST available to small taxpayers whose aggregate turnover in the preceding financial year did not cross Rs. 1 crore. In the case of 9 special category States, the limit of turnover is Rs.75 Lakhs in the preceding financial year, namely – Arunachal Pradesh, Assam, Manipur, Meghalaya, Mizoram, Nagaland, Sikkim, Tripura and Himachal Pradesh. However, if you are a manufacturer of ice-cream, pan masala or tobacco or tobacco products or if you are a service provider other than a restaurant, you are not eligible for composition scheme. You can, however, make supply of exempt services including services by way of extending deposits, loans or advances in so far as the consideration is represented by way of interest or discount. Answer: Composition scheme is optional and intimation that option has been availed should be made electronically in Form GST CMP-01 by the migrating taxable person. A person who has already obtained registration and opts for payment under composition levy subsequently needs to give intimation electronically in Form GST CMP-o2. Answer: Composition rate for manufacturers is 1% (0.5% CGST and o.5% SGST) of the turnover. Answer A registered person will have to pay GST on monthly basis on or before 20th of the succeeding month and if he has opted for composition levy he will have to pay GST on a quarterly basis on or before the 18th day of the month after the end of the quarter. Answer: No. The option to pay tax under composition scheme shall lapse from the day on which his aggregate turnover during the financial year exceeds Rs. 75 Lakhs/ 50 Lakhs. Once he crosses the threshold, he shall file an intimation for withdrawal from the scheme in FORM GST CMP-04 within seven days of the occurrence of such event. He shall also furnish a statement in FORM GST ITC-o1 containing details of the stock of inputs and capital goods as per the rules in this regard. This would help him join the input tax credit chain and avail credit of tax that he has paid on his inputs/goods lying in stock on the day he crosses over. Answer: Aggregate turnover shall be computed on the basis of turnover on all India basis. It includes aggregate value of all taxable supplies (excluding the value of inward supplies on which tax is payable by a person on reverse charge basis),exempt supplies, exports of goods or services or both and inter-State supplies of persons having the same Permanent Account Number but excludes GST and cess. Answer: No, a taxable person opting to pay tax under the composition scheme is out of the credit chain. He cannot take input tax credit on the supplies received. Answer: A manufacturer opting to pay tax under the composition scheme cannot issue a tax invoice to his buyer but would issue a Bill of Supply. He cannot collect any taxon the supplies made by him on his Bill of Supply and is required to show only the price charged for the supply. Consequently, the registered person buying goods from a composition manufacturer cannot take input tax credit. Answer: Till September, 2019, no tax is required to be paid by manufacturer under the composition scheme who receives inputs or input services from an unregistered person. Answer: No. An intimation that composition scheme has been availed in one State shall be deemed to be an intimation in respect of all other places of business registered on the same Permanent Account Number in other States. Persons who have been granted provisional registration and who opt for composition levy (Intimation is filed under Rule 3(1) in FORM GST CMP-01) 1st July, 2017. Intimation shall be considered only after the grant of registration and his option to pay tax under composition scheme shall be effective from the effective dat of registration. Persons opting for composition levy after obtaining registration (The intimation is filed under Rule 3(3) in FORM GST CMP-o2) The beginning of the next financial year. Answer: The option exercised by a registered person to pay tax under the composition scheme shall remain valid so long as he satisfies all the conditions specified in the law. The option is not required to be renewed. Answer: Such person is required to furnish the details of stock, including the inward supply of goods received from unregistered persons, held by him on the 30th day of June, 2017 electronically, in FORM GST CMP-03, on the common portal, either directly or through a Facilitation Centre notified by the Commissioner, within a period of sixty days from the date on which the option for composition levy is exercised or within such further period as may be extended by the Commissioner in this behalf. Further, if on 1st July, 2017 such person holds in stock goods that have been received from outside the State or imported from outside the Country, he is not eligible to opt for composition scheme. Answer: Yes, the registered person who intends to withdraw from the composition scheme can file a duly signed or verified application in FORM GST CMP-04. In case he wants to claim input tax credit on the stock of inputs and inputs contained in semi-finished or finished goods held in stock by him on the date of withdrawal,he is required to furnish a statement in FORM GST ITC-01 containing the details of such stock within a period of thirty days of withdrawal. Answer: Yes. Any intimation or application for withdrawal in respect of any place of business in any State or Union territory, shall be deemed to be an intimation for withdrawal in respect of all other places of business registered on the same Permanent Account Number. Answer: No, because exports and supplies to SEZ from Domestic Tariff Area are treated as inter-State supply. A person paying tax under composition scheme cannot make inter-State outward supply of goods. Answer: Job-work is a supply of service and not eligible for composition scheme. Any manufacturer or processor who wishes to carry out job-work for others would not be eligible for composition scheme. Answer: A registered person under composition scheme would not have input tax credit and he would make all his tax payments by debit in the cash ledger maintained at the common portal. The taxpayer can deposit cash any ­time in the electronic cash ledger at his convenience. The payment in cash ledger can be made through all modes available like e-payment through net-banking, credit card and debit card, over the counter of banks, RTGS or N EFT. Answer: No, registered person under the composition scheme will not pay taxes every month. He would file return and pay taxes on a quarterly basis i.e. for each quarter of the financial year. Due date for payment of tax for them would be on or before the 18th day after the end of such quarter. Answer: Rules on Accounts and Records provide details of the accounts to be maintained. They are maintained under normal course of business by any small manufacturer. The de­tails to be maintained in accounts inter-alia consists of goods supplied, inward supplies attracting reverse charge, invoices, bills of supply, delivery challans, credit notes, debit notes, receipt vouchers, payment vouchers, refund vouchers etc. Answer: No, the requirement to maintain detailed accounts of stocks in respect of goods received and supplied, work in progress, lost, destroyed etc. does not apply to a manufacturer under the composition scheme. Such a person shall maintain a true and correct account of production or manufacture of goods, inward and outward supply of goods, stock of goods, tax payable and paid. Answer: A manufacturer under the composition scheme need not maintain account of input tax, input tax credit claimed etc. as he is neither allowed to avail of input tax credit nor can he issue an invoice showing tax using which buyer can avail input tax credit. Answer: Yes, amanufacturer under the composition scheme can maintain his accounts in registers serially numbered and also issue bill of supply manually following the conditions specified in rules in this regard. Answer: No, a registered person under the composition scheme would not need to specify HSN code of their products in bill of supply or return. Answer: A registered person under the composition scheme of GST is required to furnish quarterly return called GSTR-4 upto 18th day of the month succeeding the quarter. Answer: GSTR-4 may be referred for details required to be filled in the return. It is a very simple return containing consolidated details of outward supplies, details of import of services or other supplies attracting reverse charge. Answer: GSTR-1 is to be furnished quarterly for person with aggregate turnover of Rs. 1.5 crore per annum. All others have to furnish GSTR-i on monthly basis.